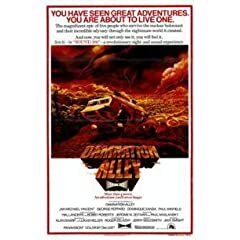 Damnation Alley is one wacky monster of a movie. It stars both Jan-Michael Vincent (the guy from Airwolf) and George Peppard (Hannibal from the A-team). In fact, you can just mash both of those old TV shows together, substitute a tank machine for the Airwolf, keep Hannibal exactly the same and you've got Damnation Alley. But, I'm not saying that it's all bad. Good mixes of giant scorpions and killer cockroaches keeps it interesting. My favorite part of the movie was when they are in Las Vegas. Thank god it wasn't destroyed! Anyway, they have these quarters and nickels and start playing slots like mad. I get shaky just thinking about it. See, there are casinos here and I think I'm addicted... so I went cold turkey. Ugh. I also figured out another valuable lesson to surviving the apocalypse. LESSON: If you are traveling across the barren wasteland, that is the post-apocalyptic United States, in a giant killer tank-van, then keep this in mind. Every other time you stop the van, something bad will happen. The other times will prolly be to pick up freeloaders. In this movie, this lesson was pointed out as follows. Stop 1: Nerdy guy dies. Stop 2: Las Vegas, freeloader chick hops on. Stop 3: Soul man eaten alive by giant mormon cochroaches.. heh. Stop 5: Stop at evil gas station, attacked by hicks. Stop 6: Have a nice dinner outside. etc. etc. etc. Anyway, it's good. Well, it's at least o.k. I still miss B.A. Baracus. .-= MEGATØN´s last blog ..KILOTØN Shots =-. RAD! I knew I liked you for a reason!